F1s Circuito de Navarra in Spain. THE FULL ENGINE LINE-UP comprises of 2.0-litre four-cylinder Ingenium turbodiesels with a choice of 163 and 180hp (both available with manual and automatic transmissions); an automatic 300hp 3.0-litre V6 turbodiesel; and a 380hp 3.0-litre V6 supercharged petrol with an eight-speed automatic 'box. Whilst the higher performance supercharged V6 petrol engine was interesting to sample on the race circuit to explore the outright handling capabilities of the new XF saloon, the core model of most importance was the XF with the 180hp 2.0-litre Ingenium turbodiesel in its engine bay. This new in-house Jaguar Land Rover variable-valve-timing turbodiesel unit, as well as the 163hp version, are claimed to be 24% more fuel and CO2 efficient than the previous Ford-supplied 163 and 200hp 2.2-litre engines used in the outgoing XF models. Crucially, the 180hp unit develops 317lb ft of torque from 1,750rpm and is available with either a new six-speed manual gearbox or, and likely to be the most popular choice for UK customers, an eight-speed automatic. Top speed is 136mph with zero to 62mph taking 8.1 seconds. Fuel consumption in the Combined Cycle is officially 65.7mpg with CO2 emissions of 114g/km, so road tax is �0 for the first year and then �30 for the second year onwards. Our test model was to R-Sport specification and with the autobox it costs �36,850 (manual gearbox versions cost �35,100). The 180hp power output  also used in the new Jaguar XE compact saloon  delivers a very respectable top speed of 136mph but, as with the XE, it's the muscular torque that gives it that real shove of acceleration. The new Ingenium engine has a growl to it but it's not intrusive, and once in 'the cruise' engine noise becomes more hushed although road noise intrusion becomes evident. Again, as with the smaller Jaguar XE saloon, it seems to be the case that aluminium body structures do transmit slightly more decibels and resonance than steel ones. With the eight-speed autobox the engine is always in its 'sweet spot' for instant power delivery  mid-range acceleration is immediate, which is very good for overtaking slower traffic. Around town the engine is quiet and very flexible. Our fuel economy, driving on some challenging but relatively traffic-free Spanish roads, was 38.3mpg; not very close to the official 65.7mpg Combined Cycle but I would expect longer runs on motorways to see this figure improve to closer to the 50mpg mark. Moving up to the 300hp 3.0-litre V6 turbodiesel brings a huge torque output of 516lb ft from 2,000rpm. This powerplant is only available with the eight-speed automatic transmission  but why would you want anything else? It is hugely responsive and made very light work of the severe mountain climbs into the Pyrenees up very narrow winding roads. For the record its maximum speed is 155mph with zero to 62mph taking 6.2 seconds. Officially the Combined Cycle figure is 51.4mpg  our test drive returned 37.8mpg; well below the official figure but only a shade worse than the 2.0-litre engine and the test driving was done on a more challenging route. The big V6's 144g/km of CO2 is not that off-putting either; road tax is �145 a year. For drivers covering long journeys who want effortless cruising performance, then this engine meets those needs very easily although for some the �10K price hike over the top-spec 180hp 2.0-litre turbodiesel may be financially off-putting. Fastest of all are the 380hp 3.0-litre V6 supercharged petrol engines: these punch out 331lb ft of torque at 4,500rpm and partnered with the eight-speed automatic gearbox are top-speed-restricted to 155mph with zero to 62mph taking a sharp 5.3 seconds. The official fuel economy is 34mpg although no figure was taken on our race circuit testing! In its latest Euro6 guise, Jaguar says this unit shows a 14% improvement in fuel economy and CO2 emissions over the previous version. For the record, CO2 emissions are a relatively high 198g/km so road tax is initially �490 but reduces to �265 after the first year. No doubt that for high-performance petrol engine enthusiasts this supercharged V6 will be the one to go for  it's fast, it's gutsy, it thrives on engine-revs and it sounds great! But it will cost you  to the tune of �50K. In terms of ride comfort and handling, the new XF saloons offer fast and precise change-of-direction handling and the well-weighted steering supplies good feedback to the driver. The ride is generally on the comfortable side, although ripples in the tarmac and potholes can unsettle the overall calmness the XF generally offers. In most ways the new XF is a larger 'cloned' version of the slightly smaller and less expensive XE. 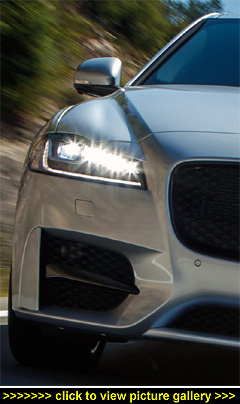 It will be important for both model ranges to attract conquest customers to the Jaguar brand rather than the XE and XF to take customers from each other with few incremental sales. The German brands manage it  so should Jaguar.